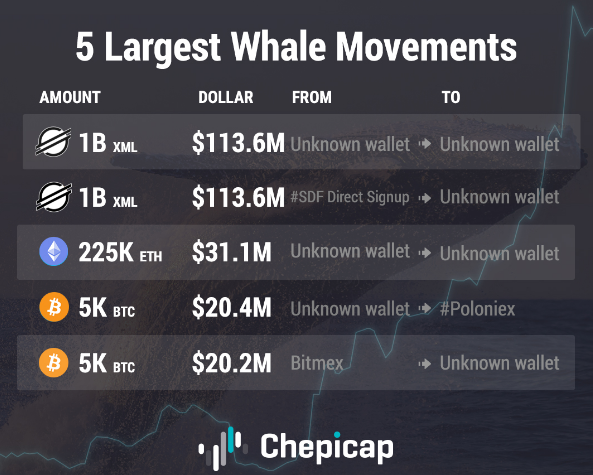 This weeks whale moves saw Stellar take top spot with two massive transactions totalling $227 million out of the combined $299 million. Also featured this week is Ethereum and Bitcoin to round off the top 5. Stellar (XLM) has had some huge announcements over the course of the last week, from being added on cryptocurrency exchange Coinbase, to the massive partnership with IBM's remittance payment system called World Wire, which will run on the Stellar Protocol. The announcements saw the project leap-frog Binance Coin to the number 7 spot based on total capitalization. So surprise then that Stellar has appeared on the top 5 whale moves for this week. Stellar surprised everyone by taking the top two spots with two transactions totalling roughly $113 million each. Second spot went to Ethereum with a $31 million move, while Bitcoin featured as usual, with two $20 million transactions. Surprise missing candidate this week was Ripple, which has featured prominently for the past several weeks. The combined top 5 transactions total $299 million with a total transaction fee of $12.67, with BTC making up 99% of the transaction fee. If you were a whale what coins in the top 5 would you be buying? wow really shocking because Stellar collaborate with Coinbase, the most suspicious platform ever! Do people really trust them and not afraid to be hacked??? It's not secure to transfer such huge sums of money to Poloniex according its current far from good reputation. Someone crazy transfered 5K BTC to rather shady Poloniex crypto exchange. moreover, who uses poloniex fur such amounts? lol, who uses polonoex? moreover, who uses poloniex fur such amounts?